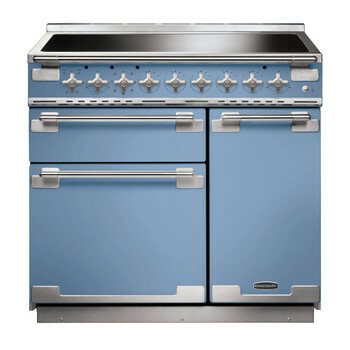 The Rangemaster Elise 90 Induction with its distinctively continental design offers a truly professional performance whilst bringing a touch of French inspired flair in to your kitchen. The stylish controls, solid doors and brushed chrome trim distinguish the Elise in the Rangemaster family as a model taking inspiration from European chefs revered worldwide. The 5 zone Induction hob is fast, responsive and incredibly controllable, offering the ultimate in speed and energy efficiency, heating just the pan not the hob itself. Spillages won’t burn to the surface making cleaning exceptionally easy. The added safety measure of residual "hot hob" indicators makes induction a great choice for families. Rangemaster’s unique Preparation and Simmer settings for melting butter and chocolate, simmering vegetables or cooking pasta help to create perfect results every time. The Rangemaster Elise also features the upgraded Glide-out Grill. The grill pan glides smoothly out on telescopic runners, making it easier to safely check on your food by eliminating the risk of pulling the grill pan out too far. The dual circuit grill also has both full and half grill settings for both ease and economy. Available in a wide selection of colours there is a Rangemaster Elise 90cm Induction Range Cooker which will look perfectly at home in any kitchen. Choose from a vibrant colour palette of black, cream, china blue, cherry red, white, slate or stainless steel all combined with a coordinating brushed chrome trim.